2. Does Electrolysis Work on All Hair Types? 3. What Types of Electrolysis are there? 4. Are there any Types of Electrolysis to Avoid? 5. "I'm Afraid of Needles - Will I be alright?" 6. Can Electrolysis give me Permanent Hair Removal? 7. 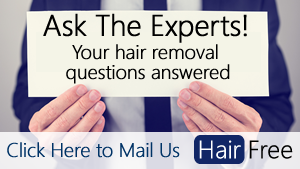 How Long does it Take to Get Permanent Hair Removal? Electrolysis has been used for over 130 years, it has been approved as a safe and legitimate permanent hair removal method by the FDA, the US Food and Drug Administration, who are responsible for public health and safety. Millions of people have been treated with electrolysis and it has by far the best track record for both results and safety. To put things into perspective, laser hair removal has only been around for 30 years, just a quarter of this length of time. So, whereas the long term side effects of laser hair removal are still being monitored, electrolysis has a proven track record. ​Unlike laser hair removal, which is mainly suited for dark hair and light skin, electrolysis is suitable for all types and colour of hair. The colour of the hair or skin bears no relation to the effectiveness of electrolysis. Thermolysis - a tiny needle (about the thickness of a hair) is inserted into the follicle of the hair being treated and a high frequency alternating electrical current is applied. The electrical current heats up the surrounding tissue and disables the follicle, causing the hair to fall out. More in-depth information is available in our dedicated article about the different types of electrolysis. Some clinics may claim to do transdermal electrolysis which works by applying electrical current above the surface of the skin rather than to the follicle directly. This is not a very effective method of electrolysis because hair is a poor conductor of electricity and, consequently, only a small amount of the tissue surrounding the hair follicle is affected. We recommend avoiding this type of electrolysis due to its being a largely ineffective method of hair removal. Whilst it is true that a really thin needle like device is slid into the hair follicle, the size of the needle is so small that the skin is not even punctured. It is nothing like having an injection or giving blood, where the skin is punctured and often a bruise may remain for a number of days. Most people who are scared of needles and injections have no problem with receiving electrolysis treatment. Electrolysis is the only method of hair removal that has been medically proven to give permanent hair removal in all cases providing the procedure is correctly delivered. "Electrolysis is considered a permanent hair removal method, since it destroys the hair follicle. It requires a series of appointments over a period of time." The US Food and Drug Administration have deemed that electrolysis is the only method of hair removal that can be considered permanent on their Removing Hair Safely page. Why is it important that the FDA have approved electrolysis? The FDA is an agency of the US government that regulates a broad range of consumer products, services and drugs in order to ensure not only the efficacy of the product, but also the safety of the consumer. ?This means that the FDA have scrutinised the electrolysis technique and have expressed that it's safe and that it permanently removes hair. Laser hair removal, on the other hand, cannot be marketed as permanent hair removal since the effects are only temporary, and whilst laser hair removal can result in permanent reduction in growth, it can't permanently stop future hair growth, unlike electrolysis. To read more about the FDA and what they regulate, click here.? There are many factors at play here and so it is very difficult to give an accurate prediction. In most cases you'll need to have a number of electrolysis sessions over the period of least 12 months to achieve full permanent hair removal. The reasons are explained more fully in our article about the lifecycle of a hair and electrolysis. For more information about electrolysis see our ultimate guide.